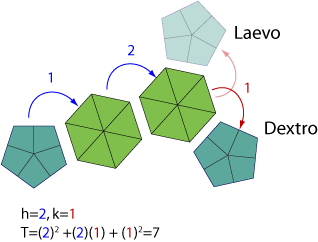 The capsid is composed 60 asymmetric units made of 7 proteins (T=7), for a total of 420 capsid proteins. These capsids are skewed, and are therefore described as either right- (dextro) or left- (laevo) handed. Papillomaviruses and Polyomaviruses are composed solely of pentameric capsomeres for a total of 360 capsid proteins. Nevertheless their icosahedral structure is that of a T=7 capsid in which pentamers occupy hexavalent positions.